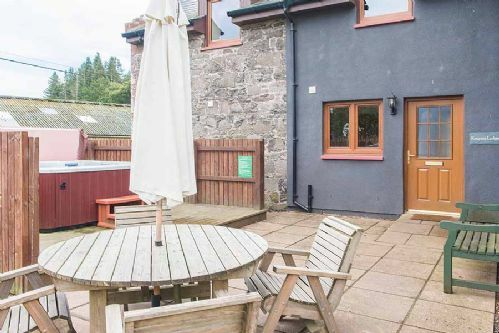 Keeper’s Lodge, sleeping 8, with Hot Tub provides a more modern alternative to the main house at Rossie Ochil Estate and is the perfect base for groups of family and friends to enjoy this fantastic part of Perthshire. All the family thoroughly enjoyed their stay. Phone reception was not great. Wi-Fi not great, but that is not guaranteed in lodge details. Such a beautiful location, peace and tranquility, great for walking. Lambing season had started, how very hard the shepherds, Kenny and his team work. Had a fantastic stay, can't wait to go again. Thank you for taking the time to leave your review, it's lovely to hear you chose to come back to Keepers Lodge for a second stay and liked the addition of the games table :) We'll be sure to pass on your lovely words to Heather and Dolly and we look forward to welcoming you back for a third stay soon. great keepers lodge has everything you need, clean, lots of space,games table,lovely walks,doggy friendly. Heather is always available if you need any help. We will definitely be back next year! Loved everything about the house. Cannot fault it. We all had a great stay. Plenty of space. under floor heating downstairs was so good on the cold snowy mornings. Thank you for taking the time to leave your review, we're delighted you enjoyed your stay with us and hope to welcome you back to Rossie Ochil in the future. Lovely lodge in beautiful location. Perfect for a peaceful break. Amazing standard for a place that accepts dogs. Had a great weekend at keepers lodge. Accommodation excellent and very well equipped. The hot tub was much appreciated by us all. Hope to have a return visit soon. Would recommend to anyone, you won’t be disappointed! Family stayed for 60th birthday, 6 adults 2 dogs, very spacious and warm house and had everything we needed to make it feel very homely. Hot tub and pool table were a great success. Lovely walks for dogs and garden enclosed to keep dogs safe. If I were to give a negative, it would be tv in lounge no signal so dvds required, but I have to say it was nice not having a tv on during our stay, as lots of things to keep us busy if we wanted to. Brilliant location with amazing views! 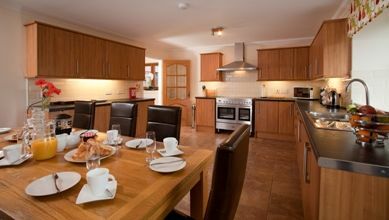 A fantastic lodge with a huge kitchen which is more than able to cope with a full house of 8 adults. The availability of a second fridge in the utility room was brilliant. 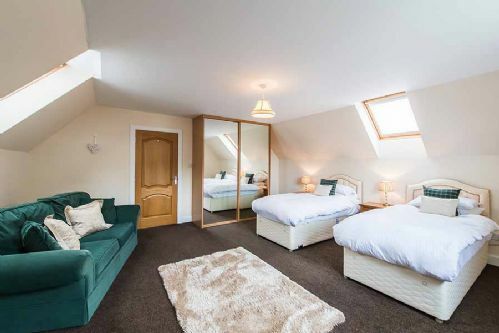 Plenty space in every room with huge wardrobes in the bedrooms and 2 full bathrooms upstairs along with a shower room and separate WC downstairs made for a very comfortable stay. Plenty parking, hot tub, pool/games table were all great. WiFi is a little unpredictable but who goes on holiday to use the internet anyway?! :) Would definitely stay again. A lovely house for a relaxing break, away from busy lives. The hot tub was well used and the games table was a great addition to keep the kids entertained. Fantastic place, fantastic location with lots of nice little touches. The rooms are very spacious with very comfortable beds. The games room was an unexpected bonus with the pool table seeing extensive use. Although the Lodge and accompanying properties are quite remote, it is easy to find and has spectacular views. The Solid Luxury staff visit daily (to check on the hot tubs etc) and are so helpful. 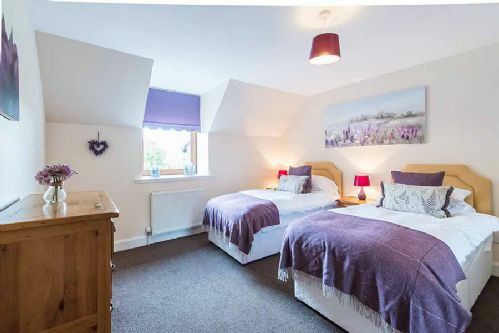 Extremely comfortable and well appointed holiday home ideal for families or groups. 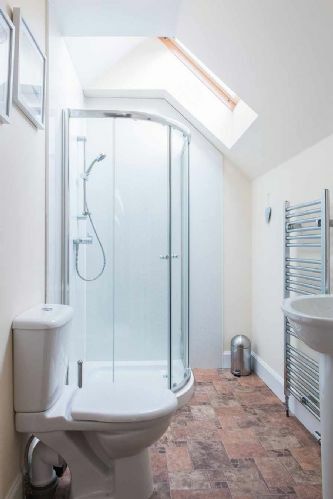 Website photographs do not do justice to the house which has 4 lovely bedrooms that can be double or twin, a main bathroom and 2 toilets/shower rooms. 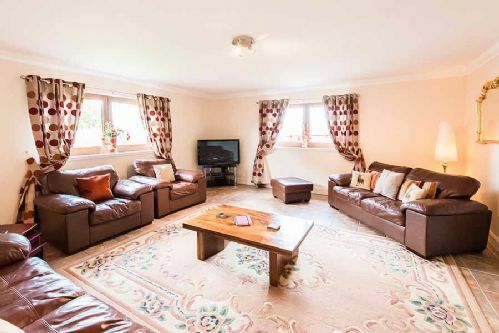 Large open plan lounge with a dining room area housing a pool /air hockey/table tennis table which is great for entertainment and much better use than a dining room as the kitchen has a large dining table which makes for sociable eating. Very considerate of self catering needs with basics provided (tea, coffee, milk and sugar) amongst other things like kitchen foil, cling film etc. These touches make a difference to arrival and catering during your stay. Also really welcoming of dogs with dog treats and blankets provided to make your pet at home. Housekeeper made herself known to us and available if anything needed. Maintenance also visited and dealt with a minor problem immediately. Grounds are just a dream for children with a hidden play area and trampoline behind the 'big house's. Very well maintained gardens and lots of walks around the estate area. A little bit out of the way (11 miles from Perth) but once familiar with the lie of the land is a good location for touring local area. Hot tub was well used by adults and children alike. Would highly recommend Solid Luxury and Rossie Ochil. We enjoyed a great long weekend at this fab property. Upsides great views and hot tub, plenty of room, loads of space for a large group (there were only two of us), enclosed garden great if you are bringing smaller children or a dog. Games room would keep older children amused. No real criticisms at all. We felt that perhaps the lighting could have been better and the lounge didn't make the best of the views that the lodge has. The games room is open plan to the lounge so that may not be to everyones taste. Overall thoroughly recommend. We looked at the big house for a party later in the year but unfortunately it was fully booked otherwise we would have been back. Keepers lodge was lovely, absaloutely spotless nothing to fault. Very spacious as well and the rooms all had sufficient mirrors and there was 3 toilets which was great for 8 girls. Thank you for taking the time to leave your review, we're delighted you all enjoyed your stay and we look forward to welcoming you back to Rossie Ochil in the future. Family summer holiday in the keepers lodge was a great hit. It was our second stay the first one being in the granary. Beautiful houses. Very spacious and clean. The games room in the keepers lodge was a great hit with the grandchild especially the organ. Central location to reach other areas. Hot tub was lovely. Staff very friendly and helpful. Hope to visit again in the future. 7 of us stayed for 2 nights to celebrate a 40th birthday and had a fantastic weekend. I had spoken to Solid Luxury in advance and asked if they could decorate the lodge for our arrival if we provided birthday decorations in advance and they were more then happy to accommodate this. The lodge looked fantastic for our arrival and made the birthday girl's day! The lodge is huge and very well-maintained. You can't hear any noise from any of the other lodges nearby. We were in the hot tub on the first night and by the time we had woken up the following morning, it had already been cleaned for us to use again that day. Highly recommend Keepers Lodge and Solid Luxury! top class property with fully equiped kitchen and brand new to the property a games room, which we made great use of. there was wifi but it was intermittent as the best of the times. keepers lodge doesnt have an enclosed private garden/hottub like other 2 and next door walk past and hover outside despite having their own private garden and drive way, however they have tried to give some privacy in hottub with fences. Thank you for taking the time to leave your review, it's lovely to hear you enjoyed your stay. We're soon going to be adding additional fencing to Keepers Lodge and although it will still not be as private as The Granary and The Old Byre it will offer a little more privacy. We hope to welcome you back to Rossie Ochil or any of our other locations in the future. Had a wonderful stay from 19 to 22 April 2018, just wish it had been longer. Staff are so friendly and extremely helpful. Accommodation is bright and airy. Kitchen is well equipped and beds are so, so comfortable. Hot tub great after a long walk taking in the stunning views. It is so peaceful, no light pollution so on a clear night the sky is truly wonderful. It was lambing season and to see the newborn lambs was a heartwarming experience. We can't wait to go again, for longer of course! Thank you for taking the time to leave your review, we're delighted to hear you had such an enjoyable stay with us and that you took full advantage of everything Rossie Ochil has to offer :) We look forward to welcoming you back soon. 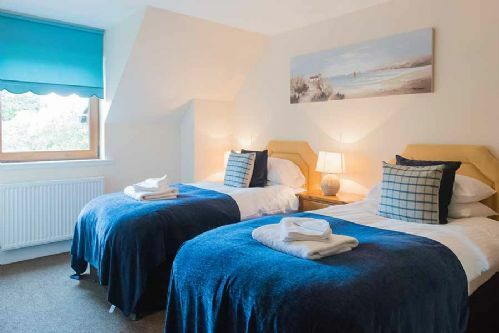 Keepers Lodge in Rossie Ochil Estate is an excellent getaway for relaxation. We had with us 4 adults, 3 children (14,13,10 years) and Alfie the dog. 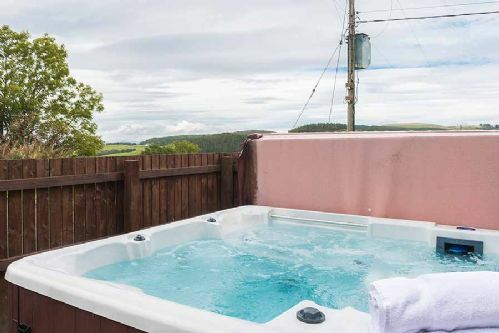 Spacious, spotless, hot tub, lovely views and best of all everything worked and was easy to use. As we drove into the estate and saw the humorous gamekeeper sculptures we knew we would enjoy. Although we were snowed in for most of the time we just adapted to the weather. When we did manage to get our cars out it was with the help of the friendly and helpful estate staff. All in all, it is an extremely well run holiday accommodation. Thank you for taking the time to leave your review, it's lovely to hear everyone enjoyed their stay and that the snow didn't dampen your spirits! We hope to welcome you back to Rossie Ochil for future holidays (maybe when the sun is shining). Thank you for taking the time to leave your review for Keepers Lodge, we're delighted everyone enjoyed their stay with us and that you got to take full advantage of the hot tub! We look forward to welcoming you back to Rossie Ochil Estate or any of our other locations in the future. Very nice place in a beautiful location. Heather and Ian were wonderful. The house was very comfortable. Thank you for taking the time to leave your review, we're delighted you enjoyed your stay with us and we'll be sure to pass on your kind words to Heather and Ian. Hired the lodge to celebrate a 40th, mixed company, mixed ages and it was a hit !!!! Underfloor heating kept us warm and cosy, the house had plenty of room for all and the hot tub just finished it off...no sorry, the icing on the cake for us was the blankets for the dogs ( we had 3 ) to allow them to snuggle on sofas with us, the whole weekend was just great. Beautiful house, beautiful location, beautifully presented. What a lovely property this is. The rooms are spacious and comfortable, the presentation is fantastic and that hot tub, wow! We got some quite heavy snow on our departure day. Sadly, the girls didn't have time to build a snowman for the next arrivals. Would definitely book a longer stay than 2 nights next time. It just wasn't long enough. We booked the lodge for a 50th birthday celebration weekend. It's was a fantastic size for 7 adults an eight year old and two dogs. Everything you needed was there and some nice personal touches like the Christmas tree and blanket and bone for the dog. Bedrooms were all made up as per our booking request and great customer service when at the last minute we decided to ask for a late check out on the Sunday. Unfortunately we didn't get a chance to use the hot tub. We brought all our own food and drink with us and there was plenty cupboard and freezer space to utilise. The lodge has a good size utility room which we used for the bigger dog to sleep in (it loved the underfloor heating). There was a good mix of bathrooms with both shower and bath options to use. Would definitely booked again and highly recommend to others looking for a quiet getaway with not to far to travel. Thank you for taking the time to leave your review, we're delighted everyone enjoyed their stay with us and that you took full advantage of everything Keepers Lodge has to offer. We hope to welcome you back in 2018 and that this time around you can get some time to sit back in the hot tub, relax and do some star gazing. Keepers Lodge was a perfect place to spend a weekend with family to celebrate two birthdays. The house was very comfortable, warm and had all we needed for our stay. The weather was perfect - so cold and frosty and the hot tub was a brilliant way to end the day. All the arrangements for our stay went smoothly and the customer service team were always friendly, polite and more than helpful. Everyone had a brilliant time and I’m sure we will be back. Thank you for taking the time to leave your review, it's lovely to hear you chose to spend family birthdays with us and that the location and house didn't disappoint. We hope to welcome you back to Rossie Ochil soon. Thank you so much Solid Luxury. What a lovely happy weekend we 8 had ! It was our first time spending a break together and it couldn't have happened in better surroundings. Where do i begin ? The accommodation is huge, and luxurious as the ad says, and don't get me started on the fabulous underfloor heating. The main kitchen is ideal and we actually had all our meals in that too. The hot tub was such a highlight, even though the weather was cold outside. The surrounding area are peaceful and there's plenty of wildlife to spot. 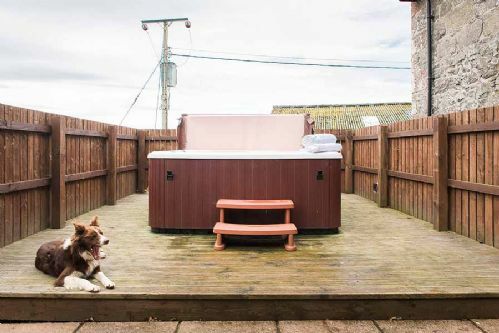 Thank you for taking the time to leave your review, we're delighted to hear you have all enjoyed your stay with us and that the Scottish weather didn't stop you enjoyed the hot tub. We hope to welcome you back to Rossie Ochil soon. Lodge was fabby evreything and more than required! Only complaint the hot tub was too cold for november should have been set higher so this spoiled the weekend! Thank you for taking the time to leave your review, we're sorry to hear about the hot tub not feeling warm enough, if you choose to stay with us again please just phone the number in your welcome book if there is anything wrong and we will ensure we get the maintenance team or housekeeping team round to see what they can do for you. Lodge was lovely and far bigger than we thought it would be,great for a weekend retreat. Well maintained and spotlessly clean. Had everything provided that we needed. The pumpkin lantern at the front door was a lovely touch. We will be back again. Thank you for taking the time to leave your review, it's great to hear you enjoyed your stay in Keepers Lodge and we look forward to welcoming you back to Rossie Ochil. Hired this house along with main house for family get together. Younger members loved the hot tub and having their own space. Thank you for taking the time to leave your review, it's great to hear everyone enjoyed their stay at Rossie Ochil and we hope to welcome you back in the future. Brilliant weekend with the girls. We stayed at Keepers lodge last year for a friend's silver wedding celebration and enjoyed it so much we decided it should be an annual event. We had a fun but relaxed weekend where we were in and out of the hot tub and shared some nice meals (and drinks) in the huge kitchen. The bedrooms are lovely and comfortable we had no complaints at all. Looking forward to next year already. Thank you for taking the time to leave your review, we're delighted you have enjoyed your second visit with us and taken full advantage of the setting at Rossie Ochil. We look forward to welcoming you all back next year. Thank you for taking the time to leave your review, we're delighted everyone enjoyed their stay and we look forward to welcoming you back in the future. Thank you for taking the time to leave your review, it's lovely to hear you all enjoyed your stay with us and we hope to welcome you back soon. We rented keepers lodge for six days subsequent to a Highland trip. The location was central to Edinburgh, Glasgow, Dundee and all of the attractions we wished to visit. Heather welcomed us on our first day assuring our comfort. The beds were very comfortable, the hot tub was spectacular and we had a grand time visiting all of Scotland ftom the comfort of keepers lodge. The views from the lodge are picturesque and we felt as if we were in our own postcard with the beauty. 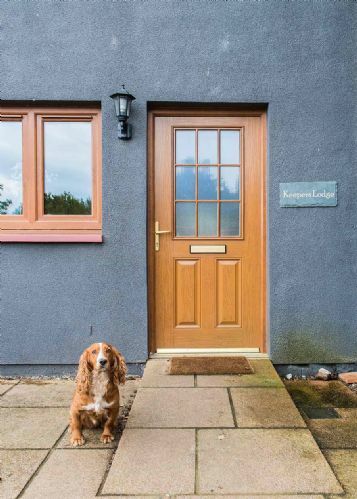 We would recommend keepers lodge highly to anyone who wants to relax and visit Scotland with the comforts of home. Thank you for taking the time to leave your review, we're delighted you have enjoyed your stay at Rossie Ochil Estate and taken full advantage of the location. We hope to welcome you back soon. Thank you for taking the time to leave your review for Keepers Lodge. It's lovely to hear you have all enjoyed your stay with us and we hope to welcome you back to Rossie Ochil Estate soon. First class accommodation in a beautiful, peaceful setting, yet not far from Perth with all its attractions. On-site and HO staff couldn't be more friendly and helpful. It is perfect for both a larger group looking for a livelier break and smaller groups looking for peace and quiet. Great walks and spectacular views. 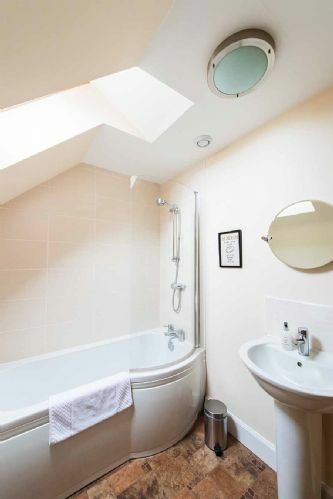 The lodge was spotless, modern and with specification way beyond expected for the price. Thank you for taking the time to leave your review for Keepers Lodge. It's lovely to hear you have enjoyed your stay with us and you took full advantage of the setting. We hope to welcome you back to Rossie Ochil Estate soon. Fantastic weekend spent with friends in a stunning house with stunning scenery. We are all sure to return soon! Thank you for taking the time to leave your review. It's lovely to hear you all enjoyed your stay and we look forward to welcoming you back to Rossie Ochil Estate. Had an excellent weekend away for my birthday with 7 of my friends. The lodge is beautiful and if anything has more space than you need! Great facilities and hot tub was the best part. Also got to feed lambs which was amazing and unexpected. The lodge is set in beautiful countryside I would say the only downfall is that its not near any places to pop out to the shops etc but not an issue with a car. Thank you for taking the time to leave your review for Keepers Lodge. We're delighted you all enjoyed your stay with us and we hope to welcome you back to Rossie Ochil soon. 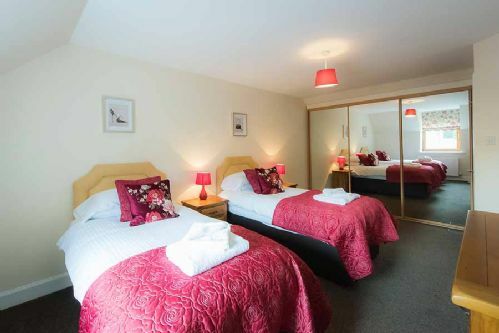 Fantastic stay, accommodation very comfortable with excellent beds for a great nights sleep. Only negative I can comment on would be the shared access through to the Granary cottage which meant my 3&4 year old could not be left out front without supervision. I would also request more hangers in the wardrobes. The whole family would love to return but next time we will try and book the Granary so we don't have to worry about cars and people passing through the outdoor area. Thank you for taking the time to leave your review, it's lovely to hear you have all enjoyed your stay with us and the hot tub didn't disappoint! We look forward to welcoming you back to Rossie Ochil soon. This is the second time we have stayed here and have enjoyed every minute. The hot tub is great fun and the house was spacious and extremely comfortable. We spent Saturday in Perth which was a short drive away and explored the surrounding countryside on Sunday. The house is well equipped, especially enjoyed the keyboard! We had a lovely stay at Keepers Lodge. 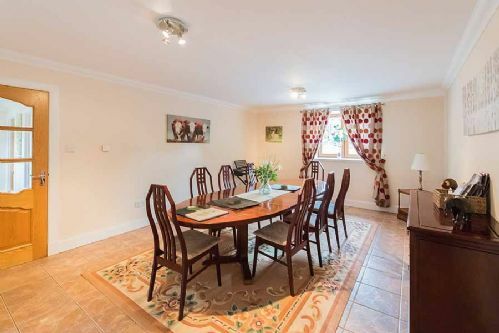 Very clean and lovely property. Only negatives are the lighting around the hot tub wasn't great and the wifi is poor. Thank you for taking the time to leave your review for Keepers Lodge, it's lovely to hear you all enjoyed your stay with us and we look forward to welcoming you back to Rossie Ochil Estate. we had a lovely break in Forgandenny, my husband and I and our 3 adult children and their partners. The lodge was very spacious and comfortable, and each room was great, it was quite far into the country but worth it when we got there, we took all our food which was just as well and had a great time. We took a walk with our dog around the lodge and the countryside was beautiful, we did not have to leave the lodge as we had a really lovely walk on our doorstep. Would certainly recommend and return again. Thank you for taking the time to leave your review, it's lovely to hear you all enjoyed your stay at Rossie Ochil Estate and took full advantage of the surroundings. We look forward to welcoming you back soon. Thank you for taking the time to leave your review, it's lovely to hear you have enjoyed your stay with us and taken advantage of the hot tub. We look forward to welcoming you back next year. We had a great family stay in Keepers Lodge. It was very well looked after and very clean. The rooms were very spacious and the beds were really comfortable. The kitchen is huge with a dining table which was great for family meals. The hot tub was well used, very relaxing after a long walk. We had a couple of rainy days so some DVDs or books would have been welcome! The surrounding area is so tranquill and the scenery is beautiful. All in all a great trip. Thank you for taking the time to leave your review, it's lovely to hear you have enjoyed your stay with us and we will take in board your suggestions. We hope to welcome you back to Rossie Ochil Estate soon. Just back from a fantastic weekend break at the keepers lodge at rossie ochil. 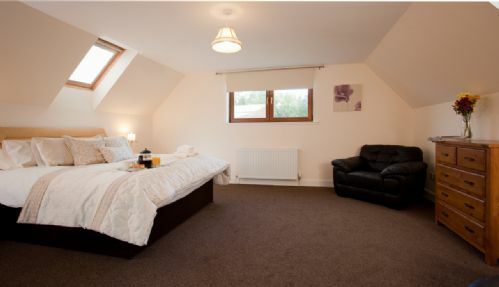 Great location, top quality accomodation with an amzing hot-tub. Cant wait to visit sometime again. Thank you for taking the time to leave your review for Keepers Lodge. It's great to hear you have enjoyed your stay with us and we look forward to welcoming you back to Rossie Ochil Estate soon. Keepers Lodge is one of the best self catering houses we have ever stayed in. It was immaculately clean, well equipped and in a beautiful setting. The hot tub was an added bonus. The staff on site were friendly and helpful. Useful tings like toilet roll, tea and coffee had been provided. We thoroughly enjoyed our stay- even with 7 adults in the kitchen or lounge, the rooms never felt overcrowded. there was no argument over bedrooms as all were beautiful and had great storage. There were 2 full bathrooms and a separate shower and downstairs toilet so plenty of amenities. Even though we decided against bringing our dogs at the last minute they were catered for with doggy chew and blankets. All in all a lovely relaxed holiday. Thank you for taking the time to leave your review for Keeper's Lodge, it's lovely to hear you enjoyed your stay and loved the cottage. We hope to welcome you back for another relaxing holiday soon. Very comfortable, beautiful setting and loads of space. A few miles from any shops and the WiFi access/mobile is limited so great to escape if you want to. Plenty to do in the surrounding area - we enjoyed the Crieff Highland Games, St Andrews, Scone Palace and a drive to Loch Lomond (about an hour away). Thank you for taking the time to leave your review. We're delighted to hear you have enjoyed your stay at Keeper's Lodge and taken advantage of the location to explore Perthshire. We hope to welcome you back to Rossie Ochil Estate soon. Having spent a week at Rossie Ochill with all my family and four grandchildren I must say we all had a wonderful time . Everything you needed was available . House big enough for everybody that you weren't under each other's feet. The children loved the hot tub. The views were excellent . I would definitely recommend this house and would love to go back again in the future. Thank you for taking the the time to leave your review for Keepers Lodge, it's lovely to hear you have enjoyed your stay with us and the children took full advantage of the hot tub. We look forward to welcoming you back to Rossie Ochil Estate in the future. A wonderful venue for a family celebration - 7 adults & 1dog. We explored the grounds of Rossie Ochil & enjoyed the hot tub on a warm,sunny afternoon. 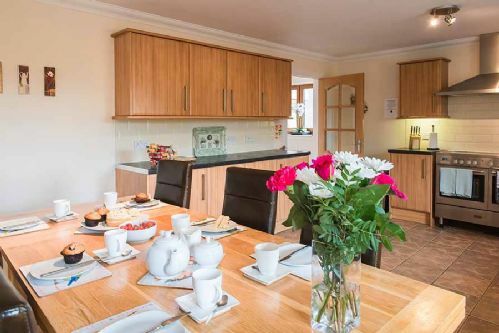 The cottage provides plenty room to relax & a spacious kitchen where many cooks can work in harmony. Thanks to Heather & Dolly for the immaculate state of the beautiful rooms. The only slight downside is that the farm buildings are quite close & somewhat obscure the views. Thank you for taking the time to review Keepers Lodge, it's great to hear you have enjoyed your stay and explored the Estate. We'll be sure to pass on your thanks to Heather and Dolly and hope to see you back at Rossie Ochil Estate. We had a wonderful time at Keepers Lodge. A large family gathering, everything we needed was on hand, well equipped and spacious even though we filled every room. brilliant weather also helped. Excellent place to stay. fantastic views would highly recommend staying here. Staff on site are very helpful. Will definitely be coming back. Plenty of places to visit not to far away. There are also plenty of walks on the estate. Thank you for taking the time to review Keeper's Lodge. It's lovely to hear you have had such a good stay with us and we hope to see you at Rossie Ochil Estate again soon. Second time staying here and was not disappointed - would highly recommend and the hot tub was a hit with everyone and made the weekend very special-will return. Thank you for taking the time to review Keepers Lodge, it's lovely to hear you have chosen to come back and stay with us and we look forward to welcoming you back for your 3rd visit.